Aircraft-inspired, the Alto combines light weight, aerodynamics and durability. You and your car will love the ride. 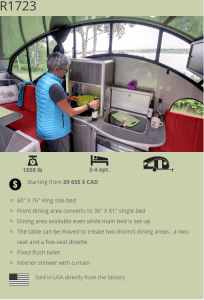 Based in Quebec, Safari Condo offers a unique 17-foot, 3-inch travel trailer that’s available to the U.S. market. The lightweight, rounded-body Alto R-Series has a seamless-aluminum retractable roof that is opened and closed with the push of a button by a pair of electric linear actuators. 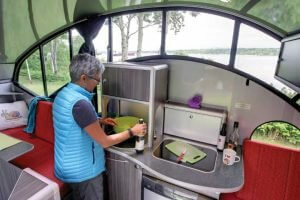 Within minutes, the 7-foot-tall (exterior) trailer is transformed into an 8-foot, 5-inch-high light-and-bright oasis-on-wheels for the true outdoor lover, with crescent-shaped tinted-tempered-glass windows lining both sides. With the roof retracted, the refrigerator, toilet and beds are accessible. Its independent Flexiride suspension and very low centre of gravity provide great stability to the Alto. Its floor and frame are made of aluminium. For maximum aerodynamics, the weld-free frame supports streamlined tanks. 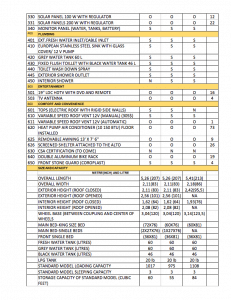 Powerful electric brakes come as standard equipment. Faced with the steady increase in the price of gasoline and the social responsibility we all share to save non-renewable fossil energy, Safari Condo wanted to design ultra-light travel trailers with the lowest possible drag coefficient. 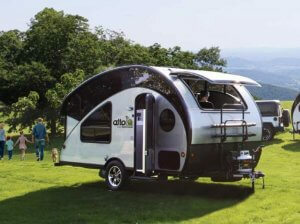 Travel trailers meeting these two criteria could then be readily towed by smaller vehicles. Even more environmentally conscious, Safari Condo also wanted its materials selection to be not only lightweight but for the most part recyclable. 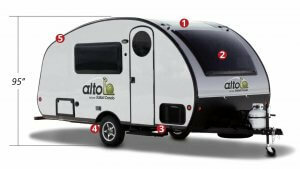 Two Alto R-Series floor plans are available with self-containment features that include 15-gallon freshwater and 11-gallon black and gray holding tanks, a fixed-flush toilet, a dinette and sleeping for three. The R1713 has a 72-by-76-inch bed that can be converted into two beds, and the dining area transforms into a 36-by-81-inch bed. 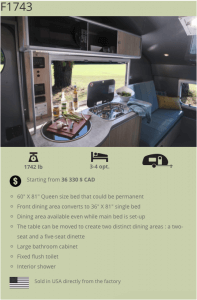 The R1723 has a 60-by-76-inch bed, a convertible dinette and a curtained-off interior shower. Roof and walls are made of a sandwich-type material with a plastic honeycomb core laminated with aluminium (aluminum) on one side and Alufiber or aluminium on the other. Alufiber combines the lightweight of aluminium with the durability of fiberglass. 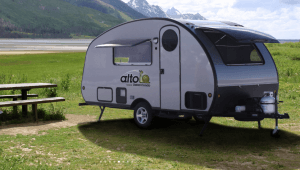 The only materials used in building the Alto are those on which water has little effect such as aluminium, Alufiber, plastic, Formica and glass. Inside, the furniture consists largely of aluminium and composite materials. Rigid and ultra-light sandwich panels are integrated into the bed cushions, while the entire bed structure is made of aluminium extrusions. With an exterior height of only 83,5 inches (2,12 m) with the roof down, all R-series Alto models fit easily in your garage. 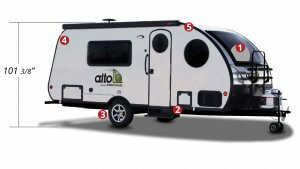 With the roof up, they offer a very comfortable living space with an 82-inch (2,08 m) interior clearance. Their front dining area is usable even with the rear bed deployed. Beds, fridge, storage and toilet are all usable even with the roof down. You can create two different dining areas by simply moving the table. A model with indoor shower is available. Imported from Europe, the double glazed panoramic acrylic windows of the F series provide both lightweight and superior insulation. The window includes a built-in combination blind/screen system. This type of window provides such a large opening that one almost forgets being inside. 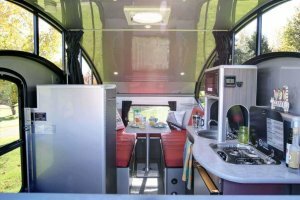 The front dinette, with its huge curved window, can be used even while the rear bed is deployed. In addition, by moving the table, it is possible to create a four seat dining area. The seamless aluminium roof is built in a single piece of curved Alufiber/aluminium sandwich panel. Its generous interior clearance provides easily accessible ample storage. It comes with a large private shower/toilet cabinet. 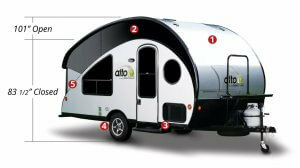 With its exterior height of 95 inches (2.5 m), the F series Alto will fit under an 8-foot garage door. Using the streamlined shape of the R-series roof, the new F series retains its aerodynamic properties and remains easily towable by most compact cars or small SUVs. A simpler design means a lower purchase price. Keeping the same materials and the same large windows as the F17 series, the F21 series offers a more spacious interior and more generous storage. 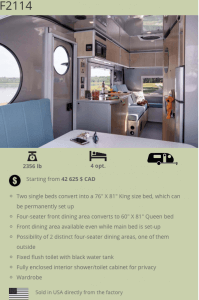 Designed to fit 4 people comfortably, this series includes both King and Queen size beds, larger water and propane tanks, a roomier fridge and a more powerful combined heater/water heater system. The 4-seater front dining area has kept its huge curved window, and remains usable even when the rear bed is deployed. Furthermore, the table can be moved and attached to the side of the trailer to create an exterior dining area. Its generous interior clearance provides easily accessible ample storage. It comes with a large private shower/toilet cabinet. Using the rear and front curved shape of the R-series roof, the new F21 series retains its aerodynamic properties and remains easily towable by most small SUVs. 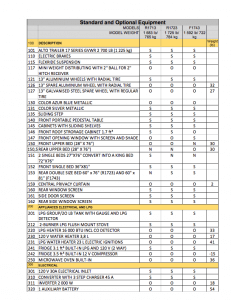 If you’re interested in an Alto, plan ahead, because the wait time is approximately 18 months, as each Alto is built to order. At this writing, base MSRP in U.S. dollars was just under $30,000, which includes the $750 brokerage fee to transport the trailer across the border. 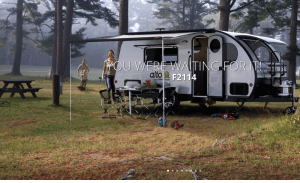 Previous Article What Cars Can Be Flat-Towed Behind An RV? 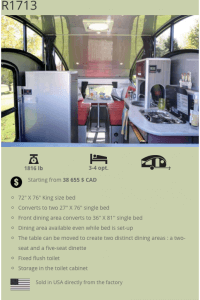 Next Article How Much DOES It Cost To Rent An RV?